How to identify SEO Over Optimized blog or website? If you were anywhere near this blog or other blogs about SEO and stuff these past few days, then you'll know what the fuss is all about with Google's updates. Google has been pretty active lately, what with the Penguin and Panda and 50 other minor updates. In essence, it has been going to great lengths to return good quality search results to users. Google is coming down, and coming down hard on "spam" websites that are over-optimized with respect to SEO. We've been hearing a lot about this "over-optimized" thing. So what exactly is SEO over-optimization? And how do you know when your site, or some other site is over-optimized? Part6: What is the ideal Word limit for an optimized Blog Post? Now SEO over-optimization is not a good thing. If you are using such tactics, then stop immediately! I know some sites have found loopholes in Google's algorithms, and are exploiting them with over-optimization, but that doesn't mean you have to do the same. Who knows when the noose will tighten? Search Engine (over-) Optimizers might be winning battles and skirmishes, but it's a war they cannot win. Head of Google's web-spam team, Matt Cutts, said in March that Google has been working on penalizing overly optimized sites for the past few months. He explained that with this, Google plans to level the battlefield so that no one has an advantage, and the top rankings are determined by brute strength, i.e. good content, rather than cunning tricks (black hat SEO). This way, sites with little SEO but good content will come up, while sites with extra SEO but poor content will go down. So let's now talk about what things entail over-optimization, and how you can detect or avoid it. What an over optimization penalty entails? But gathering facts from the messages and notices Google has been putting out, we can get a general idea as to what things we should avoid. 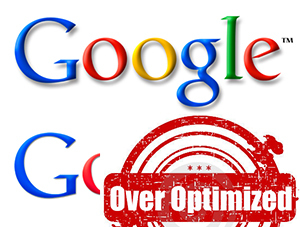 Here are some over optimization practices that you need to stay away from. Recently, Google started giving out lots of warning messages to webmasters through the Webmaster tool, informing them about some bad linking structures with their sites. Here at MBT, we always discourage buying backlinks. These are bad, automated links. So take a look at what sort of links you have. Start using Google Webmaster Tool to get notified. Another fairly common practice is making inbound links from other websites one might own. Usually, people create multiple sites to supplement their main site. These sites, of course are low quality. Some people might even employ automated mechanisms to make these side-websites look genuine. So if you have links coming to your website from other sites you own, then this practice falls into the category of over-optimization. Link anchor text is also very important. Anchor text is the text that displays instead of the actual link. For example, Google is the anchor text for the link www.google.com. Now if many of your inbound links have the same anchor text, then it hints at automation. This usually happens when you buy backlinks, which is why you should never do that. Now you might not be aware about you backlinks, but you sure as hell know what you are doing when you hide or cloak some content. This is a ruthless black hat SEO technique. Cloaking means hiding some content from the search engine, or displaying a version of some text to the search engine that is different from the one presented to the user. This is usually used in over-promotion, phishing, etc. Hidden text is text that is made invisible to the readers so that they can't see what they're clicking on. This trick can be achieved by playing around with colors. For example, white text won't show against a white background. These techniques are unethical, and cheap. And you should never use them. Using too many keywords in your titles, meta descriptions, intro paragraphs etc is considered as over-optimization, since putting up more keywords is a desperate attempt at gaining a search engine's attention. Google has started penalizing sites that have a high keyword density. Usually, anything above 2-3% density is high. H1 tags are a lot more appealing to search engines than other tags. So some people use multiple h1 tags to gain attention. Well that is just plain wrong. Always use one, and only one h1 tag per page. Use h2 and h3 tags for headings and subheadings. Now if you have changed the file name for a page, then redirects are okay. But redirecting just for the sake of gaining ad income or directing you to affiliate pages is just sad. Too many redirects, and Google will catch you spamming. It often happens that those who are unable to write good quality content, they resort to these over optimization tactics. And since they don't have much content to write about, they re-use their content a lot. While quotes and stuff are okay, but copying paras from old posts and rephrasing them is wrong. You know someone's desperate when you see pop-up ads on their websites. While pop-ups themselves are bad, some webmasters make it even worse. They deceive users by designing an exit 'cross' button where a cross would normally be. And when someone wants to close the ad, they click this button, which is actually a link to an ad or something. While this ensures a high click-through rate, it is highly unethical, and must never be used.